We regret to have to inform Members that Life Member Max Payne passed away on Thursday 12 January. He had been suffering from cancer for some time. A director of a bacon-importing and meat-processing company, General Provisions Ltd, based in the West Midlands, Max started racing in 1969 with a Lotus Elan +2 and stayed faithful to Elans of ever increasing performance throughout the 1970s. With the ex-Norman Cuthbert 26R in 1972 Max enjoyed considerable success, winning seven races. When that car was irreparably damaged in someone else’s accident, Max replaced it with a Paul Ivey-built Elan with which he finished third overall and second in class in the 1975 BRSCC Modified Sports Car Championship. 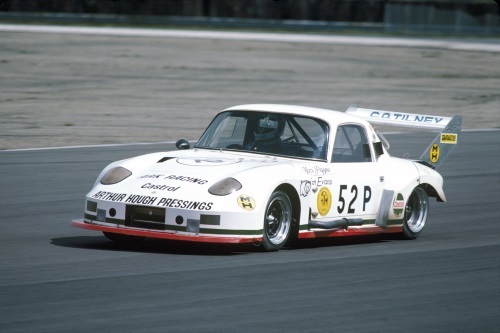 Derek Matthews of Ark Racing first provided a more potent engine, and then for 1977 a completely new Elan and the following year Max again won seven races of the 28 which he contested. It was with this very hot Group 5 Elan that Max first ventured on to the international scene, initially in the Rivet Supply Silverstone and Brands Hatch 6 Hour rounds of the World Manufacturers’ Championship with John Evans as co-driver; although they had to retire from both races, visits to Zandvoort and Zolder were rewarded with victory in Holland and second place in Belgium. The ultimate Elan, based on a design which had first seen the light of day 20 years earlier in 1962, had one last season in 1982 with Chris Ashmore now sharing the driving but was beset by unreliability so Ark Racing was commissioned to build a car for the newly-announced Group C Junior (later C2) category of the World Endurance Championship. The resultant Ceekar 83J-1, powered by a 2-litre Cosworth BDX engine from the Group 5 Elan, first appeared at the 1984 Grand Prix International Silverstone 1000 Ks and also ran in the WEC rounds at the Nurburgring and Brands Hatch with Chris Ashmore as co-driver. The following year the small Ark Racing team contested eight rounds of the WEC with Max always as one of the drivers, and either Chris Ashmore or David Andrews his co-driver. In the Canadian WEC round at Mosport Max and David finished eighth overall and third in the Group C2 category. At the end of the season third was also the position in which Ark Racing finished in the C2 teams’ championship while Max was fifth in the drivers’ championship. However, by now it was apparent that the 2-litre BDX engine was running out of steam against the predominant 3-litre or larger Cosworth DFVs so, while the Ceekar was substantially re-fettled to accommodate one of the latter engines, Max kept his hand in through 1986 with some outings in the works Gebhardt JC853 which included sixth overall and second in C2 at the rain-affected Nurburgring 1000 Ks, sharing with Walter Lechner and Ernst Franzmeier. The Ceekar was back for three 1000 k races in 1987 at Silverstone, Brands Hatch and Spa Francorchamps with Lawrie Hickman sharing the driving but results were modest. Then, during practice for the opening round of the 1988 season at Jerez, the Ceekar’s throttle stuck open and Max crashed heavily, sustaining significant leg injuries from which he recovered but he never raced again. The remains of the Ceekar were scrapped; it may be a footnote in the history of international endurance racing but it allowed Max and Derek Matthews to show how it was possible in the Group C era to race effectively at world championship level on limited resources sustained by driving and engineering ability. The BRDC extends its sincere condolences to Max’s wife Lesley and their family. The funeral will be held on Thursday 9 February at 1.30pm at Streetly Crematorium, Sutton Coldfield. Members are welcome to attend.